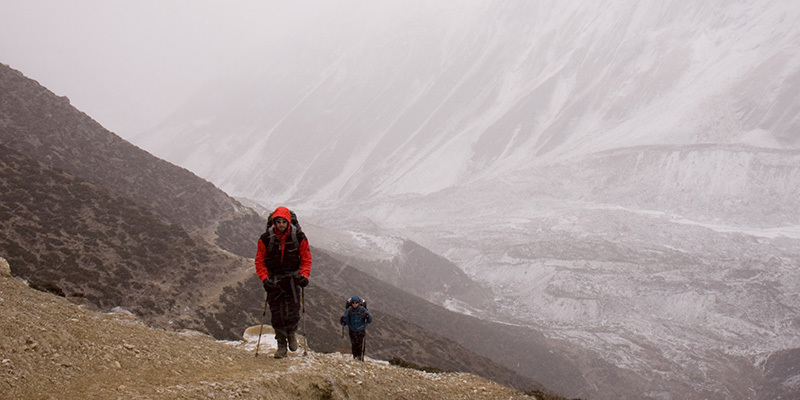 The Manaslu trek 12 days is the perfect trek for individuals who are physically active. It is also a great option for those who are running on a tight schedule. It is the perfect trek with magnificent views and side trips as well. 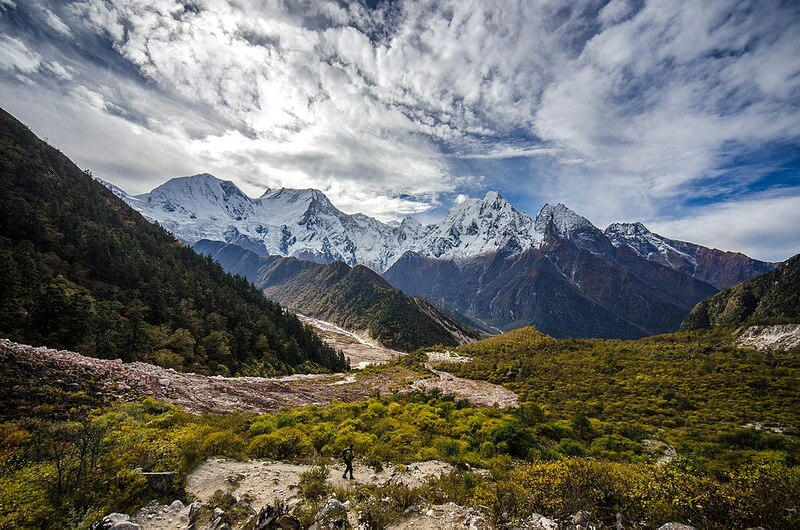 Within this trek, you will climb to the base camp of the 8th highest mountain in the world, Mt. Manaslu and cross the Larkya La Pass. The Manaslu Trek offers everything that a trek to Nepal should entail. It includes views of pristine mountain ranges, beautiful scenery, and diverse landscape. The culture and views of magnificent snow-capped mountain peaks do add to make a memorable trek. You can increase the number of days of this trek. The longer duration of 16-20 days Manaslu Trek is better and more comfortable for the novice and beginners. Different, small peaks to climb like Larkya, Samdo Himal, Panbari, Nirekha, Khayang, Saula. These are a great achievement that you can add to your experience of Manaslu Trek. Manaslu Base Camp and the Manaslu glacier. Larkya La Pass. You can see four glaciers converging from here. Tatopani- a natural hot spring. An authentic, Nepali trekking experience. Your trek to Manaslu begins with an 8-hour drive to Soti Khola from Kathmandu. Soti Khola is the starting point of your actual trek. This long drive gives you a great opportunity for amazing sights of terrace farms, villages, hillocks on the way. Your actual trek on foot begins today. You will walk to Machha Khola which is around 23 km from Soti Khola. You will begin with a downward trek to Lapubesi. From here on, you will witness beautiful waterfalls, rivers, forest along the way. Today you will trek through up and down trails and also climb a steep uphill trail. This takes you to Tatopani. Tatopani is a hot-spring site. If you make it in good time, do take a soak. It helps to relax your muscles and joints. From here, you climb a ridge to cross a suspension bridge. After this, you climb a stone paved staircase, another ridge and cross over yet another suspension bridge. After trekking a distance of 22.89 km, you will reach Jagat. Jagat is the entry checkpoint of Manaslu Conservation area. You will spend the night in the beautiful village of Jagat. Your journey today begins with climbing over a ridge. You pass through beautiful, quaint little Gurung villages like Sirdibus, Phillim, Ekle Bhatti. You will also trek through terrace fields, beautiful rivers like Ghatte Khola, Deng Khola. Once you reach the steep and deserted gorge, you start your descent. From here, you will pass through tall pine trees, bamboo forests to reach the village of Deng. You will cover a distance of 20-21 km today. Night at Deng. This day, you will travel to the beautiful village of Samagaon. You will cross the Budhi Gandaki river, walk through forests, stone arch, chortens, and barley terrace fields. Once you reach Lho, you can rest and have lunch. You can also explore the monastery here. Hereon, you will have fulfilling views of the great Himalayas. After Lho, you will trek through the village of Shyala, cross ridges till you reach the fields of Samogon. You will cover a distance of 28 km today. You will rest for the night at Namrung. This day, you will travel to the beautiful village of Samagaon. You will cross the Budhi Gandaki river, walk through forests, stone arch, chortens, and barley terrace fields. Hereon, you will have fulfilling views of the great Himalayas. 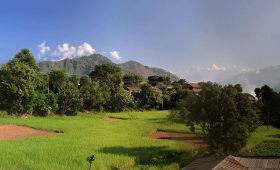 After Lho, you will trek through the village of Shyala, cross ridges till you reach the fields of Samogaon. You will cover a distance of 28 km today. You will enjoy a pleasant night at this beautiful village Samagaon. Today is a rest/acclimatization day in Samagaon. This is a beautiful village. You can choose to explore the village to get an insight into the local culture and lifestyle. You can visit the Pungyen Monastery. Or you can choose to hike to Birendra Taal. Birendra Taal (lake) at 3,450m is a gorgeous, glacial lake. 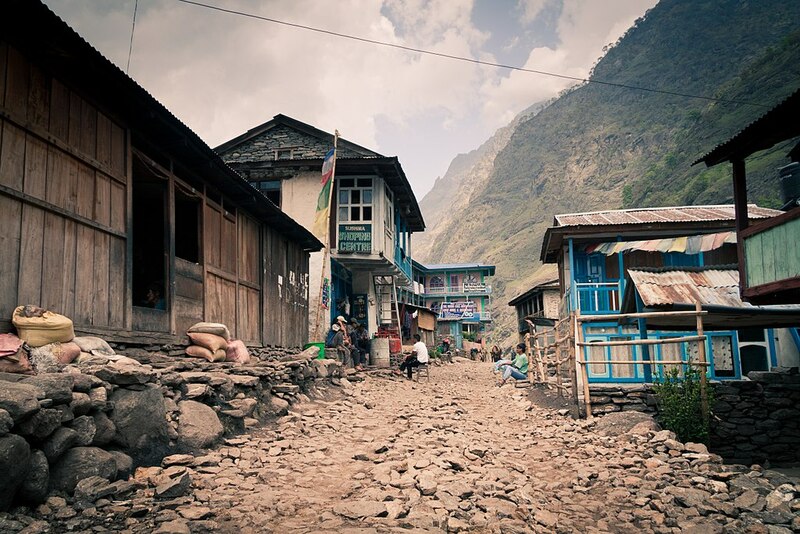 Samdo is a Tibetan refugee village and your stop for today. 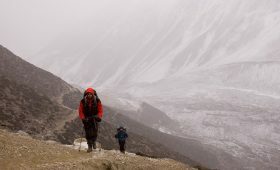 You will walk to Samdo via the Manaslu Base Camp. On this day, you will trek through beautiful juniper and birch forests to the base camp. Once here, you can witness the mighty and awe-inspiring mountains. You will get one of the clearest views of Mt. Manaslu. You will trek around 16 km today. Night at Samdo. Dharamshala is also known as Larkya Phedi. Today is a short day of the trek with a distance of only 12 km. You will come across the magnificent Larkya Glacier today. By the end of the day, you will rest at Dharamshala. Today you will pass the highest point of your Manaslu 12 days Trek. It is the famous and difficult Larkya La Pass at 5213m. Once here, you will get rewards of some of the best views of the Himalayan range. You can witness the magnificent Mt. Annapurna II, Cheo Himal Kang Guru, and Himlung Himal. After crossing the pass, you climb down towards a grassy moraine. The trails become easier hereon. After a further trek of 6 hours, you reach the beautiful village of Bimthang. Although the hours you trek is longer today, you cover a similar distance of 25 km on this day. This is the last and one of the longer days of your actual trek. You cover a total distance of 34 km. After crossing of the pass and reaching the base camp, this part of the trek does seem easy. Today, you pass the Dudh Koshi river. You also trek through deep pine forest and forests of rhododendron. You also get an amazing view of the Marsyangdi Valley. From here, you reach Tilije, the Gurung village famous for it’s locally made brandy. From here, you will also come across various police checkpoints. Then you reach Dharapani. It is the entry point of the popular Annapurna Circuit Trek. You will rest for the night at Dharapani. This is the last day of your trek. Today you will get to Kathmandu via jeep or bus from Dharapani. It is a 7-11 hour journey by road. You cover a journey of 377 km on this day. We will take you to your hotel where you can rest for the night. The Manaslu Trek 12 days is a moderately strenuous trek. This is partly due to the short duration of 12 days. You don’t need to be a professional climber to do this trek. However, you must prepare yourself phu=ysically and mentally for this trek. You need to be able to walk for about 6-7 hours per day for the duration of the trek. The uneven and rocky trails go up and down. 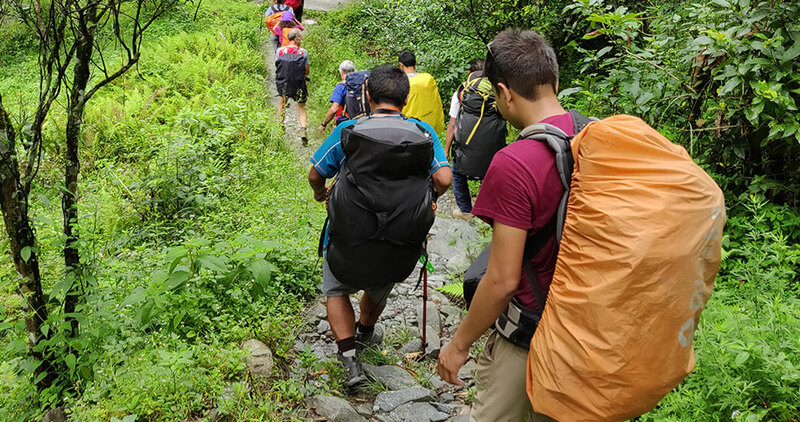 Hence, having a moderate fitness level can help improve your comfort during the trek. Note: You do not need TIMS (Trekking Information Management System) for this trek. Manaslu Trek 12 days is possible throughout the year. Each season of Nepal has its own perks and downsides for treks. 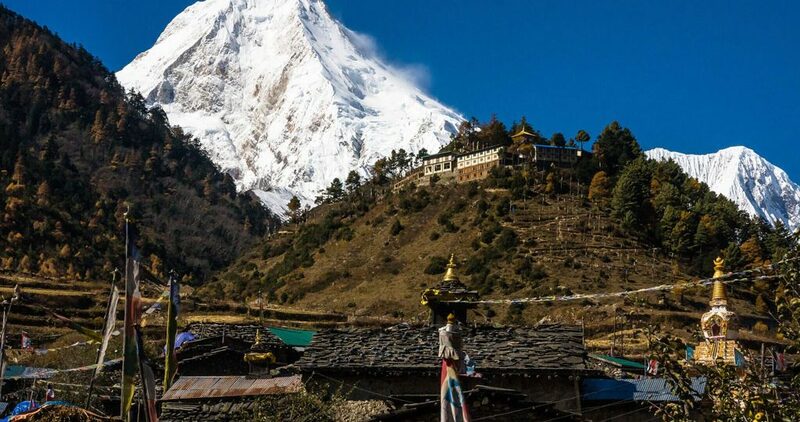 The best time to do the Manaslu trek is the local spring (March, April, May) and autumn (September, October, November) season. These seasons have cool and slightly stable weather conditions. Spring is also popular for climbing to the peak of Manaslu. Spring is also when you can see the blooms of the flowers in the lower regions. Autumn is another great time of the year to trek to this region. The temperature is just right and it supports your trek. You do enjoy glorious mountains and spectacular views of the landscape. Summer is for the adventure seekers. The trails are muddy and slippery with mosquitoes. Yet, with nature in its full glory, you can enjoy the surprises of good weather and clear blue skies. Summer is also great to spot beautiful rainbows in the Himalayas. Winter is cold and Larke La Pass may remain closed for safety and due to weather conditions. You also may not be able to reach Manaslu Base Camp during this season. Yet this season gives you magnificent views of snow covered hills and mountain peaks. You can do this trek as tea house trek or camping. For camping, you will be sleeping in tents that you bring with you. For tea houses, you will sleep in different tea houses along the Manaslu trekking trails. Most of these tea houses provide basic rooms on twin sharing basis. You can ask for a single room for more cost. The rooms have a clean bed, mattress, sheet, blanket, and pillow. The meals and drinks available on the trails of Manaslu Trek are very basic. You get a limited option on your menu. You can order noodles, rice (steamed, fried), soups. For drinks, the choices include soft drinks, boiled or bottled water, tea, coffee, flavored cold and hot drinks. In the lower regions, you may have more choices in both meals and drinks. Do try the local dishes like Thakali and mushroom soup. Solo treks are not possible for this trek. The Manaslu region lies in the restricted region of treks in Nepal. Hence, the government of Nepal doesn’t allow solo treks in the region. 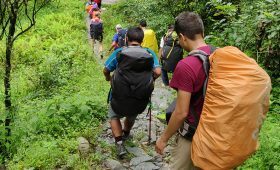 You need to have groups of 2 or more trekkers along with a local trekking staff. The government regulations of Nepal do not allow foreigners to trek Manaslu region without a local trekking staff. You have the option of hiring one or more local trekking staff. The local trekking staff can be your guide, porter, porter-guide. Make sure to check their credentials like professional license required for the job. Each of the local trekking staff has their own perks. Having a moderate fitness level is good enough for this trek. You don’t need to have an athletic body or abilities to do this trek. Make sure you are comfortable walking for long hours for the entire duration of the trek. This rapid 12 days Manaslu Trek can be quite challenging for novice and beginners. So, if you are a novice or a beginner to fitness regimes then make sure you prepare for the trek at least 6-8 weeks before the trek. This helps improve your comfortability and enjoyment during the trek. Make sure to consult your doctor before any trek. This ensures you know of any situations you may face during the trek. Also, make sure to let your trekking partner and local staff know about any health complications. Manaslu Trek 12 days is a high altitude trek. You will cross altitudes of 4000m during this trek. Hence, having information regarding high altitude and everything that comes with it is beneficial. This prepares you for symptoms, precautions, and steps to take to avoid high altitude sicknesses. Make sure you have everything you need for a high altitude trek in Nepal. Your packing list does differ from season to season. The Manaslu Trek 12 days is one of the best 12 days trek in Nepal. It takes you through different landscapes, forests and beautiful, quaint villages. You also have the opportunity to explore the different culture, lifestyle of the villages along the way. If you have any further inquiries regarding your Manaslu trek or any other trek and tour in Nepal, feel free to contact us.